Kimba is located half way across Australia. The town lies 97 Kilometres east of Wudinna and 89 kilometres west of Iron Knob. 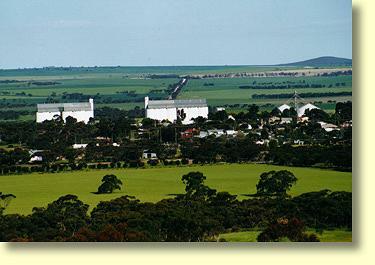 Kimba is situated at the northern edge of Eyre Peninsula's truly vast grain growing belt. Early explorations of the Kimba and Gawler Ranges districts were made by Edward John Eyre's expedition in 1839. Near Kimba, Eyre discovered water and camped at Refuge Rocks. Locals now refer to this camp site as Secret Rocks. 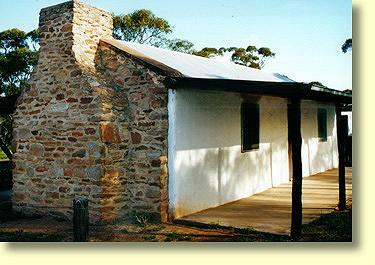 By the 1870s Kimba had been opened up to pastoral lease holders. More intensive European settlement of the area commenced in 1908 however, when the pioneering Haskett family sowed their first wheat and oat crops. Kimba's early pioneers often referred to the area as Heartbreak plains. In all truth Kimba's early pioneering years were very tough indeed, with many farmers constructing primitive huts from flattened kerosene tins. Early transport on Northern Eyre Peninsula was equally primitive and typically consisted of Bullock Teams and Camel Trains. Such transport become outmoded with the completion of Kimba's Railhead in 1913. In common with other Eyre Peninsula towns of the time, water was freighted in by rail once a fortnight. Today Kimba is the centre of a major wheat growing area, and site of one of South Australia's largest inland grain terminals. The name Kimba has its origins in a local aboriginal language and is said to mean "Bush Fire". Kimba is a pleasant and reasonable sized Eyre Peninsula town of about 800 people. For the traveller Kimba provides close to a full range of services. Both the ANZ and State Bank of South Australia have branch offices within Kimba. Kimba's Post Office also acts as an agent for the Commonwealth Bank. Travelers should be aware that Kimba does not have Automatic Teller Machine (ATM) facilities. Within Kimba EFTPOS is available at the local supermarkets, the Kimba Hotel, and at Kimba's 2 Roadhouses. Located on the western side of Kimba is the Shell Roadhouse. This Roadhouse provides fast food, basic meals, offers a rest area and acts as the local tourist inormation office. Travellers should be aware Kimba's Roadhouse closes early in the evening, and that the nearest 24 hour Roadhouses are located 350 kilometres to the west at Ceduna, and 150 kilometres to the east at Port Augusta. Should you be travelling through the night it might well be good advice to refuel at Kimba. Within Kimba, barbecue and toilet facilities are available at the Lions Memorial Park - located on Park Terrace. Conveniently located nearby is Apex central Park which has a children's playground. Along the edge of the Eyre Highway there's also another shaded picnic area called "The Gums" which has barbecue facilities. For further information contact Kimba Motel Caravan Park on (08) 8627 2222 or view www.kimbcaravanpark.com.au. Prices are valid as at November 2011. For further information Email stay@kimbahotel.com.au or view www.kimbahotel.com.au Alternatively telephone (08) 8627 2007. Prices are valid as at February 2012. Without doubt Kimba's most notable landmark is the Big Galah which is located by the wheat silos. 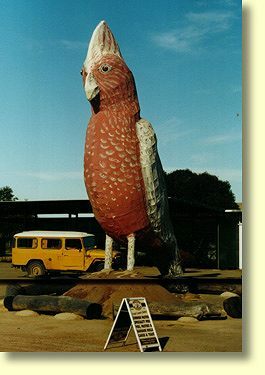 Australians seem to love big kitsch objets d'art and the Big Galah is no exception, standing fully 8 metres tall. While you're admiring the Big Galah - or should I say gawking at it - you might visit the Kimba Half Way Across Australia Gem shop which is located a few metres away. Kimba's Gem shop has a range of Australian Gemstones, but jewellery set with the locally mined Cowell Jade is particularly impressive. Cowell Jade is unique in that many specimens exhibit a jet black colour. As a gemstone Cowell Jade is particularly hardwearing, and polished specimens often exhibit a fine mirror-like lustre. The more common garden green variety of Jade is also sold at Kimba's Gem shop. Opposite the Grain Silos is the Kimba and Gawler Ranges Museum. Within the museum are many historical artefacts from Kimba's pioneering days. Generally the museum is open on Saturdays between 1-30 PM and 4-00 PM. Special opening times can be arranged however, if you telephone 8627 2344, 8627 2121 or 8627 2080. Kimba's museum also has an outdoor display area which is open at all times. Located by the Eyre Highway on Kimba's western outskirts is the Sturt Pea Shoppe. This enterprise is reportedly Australia's largest commercial grower of Sturt's Desert Pea, South Australia's floral emblem. This shop is open 9-00 to 5-30 PM Monday to Friday. For the traveller the Sturt Pea Shoppe is of particular interest as it is Kimba's official Tourist Information Centre. Kimba is located a short drive away from the Lake Gilles and Pinkawillinie conservation parks. To the north lies the rugged Gawler Ranges, and to the South west is Caralue Bluff, Carrapee Hill and Dark Peake. These areas often abound with wild flowers, native birds and other Australian wildlife such as kangaroos, emus and wombats. Road conditions in some of these areas are very variable, and it is recommended you seek local advice from Kimba's Tourist Centre before venturing into them. Further information on Kimba and the surrounding area's attractions can be viewed at Kimba Council's website. Kangaroos are often seen on the Eyre Highway between Iron Knob and Kimba. Take particular care at night as they can be a traffic hazard. My brother affectionately refers to kangaroos as the panelbeater's friend!